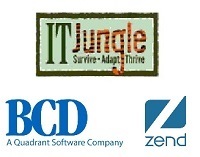 In this IT Jungle article, Zend And BCD Get A Little Closer For PHP, Alex Woodie covers BCD and Zend's expanded partnership. "Zend Technologies and BCD have been working together for about three years to help IBM i shops adopt PHP for developing new applications. Under a new partnership agreement unveiled recently, Zend will be referring customers to BCD for custom PHP-on-IBM i development work. But that's not all the two vendors have up their respective sleeves…"